You don’t need to be a mixologist from Manhattan or a bartender from Brooklyn to make more than 100 of the Big Apple’s most celebrated and classic cocktails! With bars, lounges and pubs dotting almost every block in the city, the Big Apple has an unmatched and incomparable cocktail culture—and now you can travel straight to the epicenter of this trendsetting city with more than 100 creative, as well as classic, cocktail recipes. 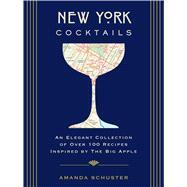 Take a virtual tour of iconic NYC establishments through breathtaking, full-color photography, scene-setting bar descriptions, and mixologist insights—and a plethora of party planning pointers, shopping tips, and must-visit hotspot suggestions make this the perfect guide to the cosmopolitan art of New York City cocktail crafting.